C. Jane Kendrick: How Do I Afford My Rock n Roll Lifestyle? How Do I Afford My Rock n Roll Lifestyle? Last night was my first night on the town since having a baby three weeks ago. 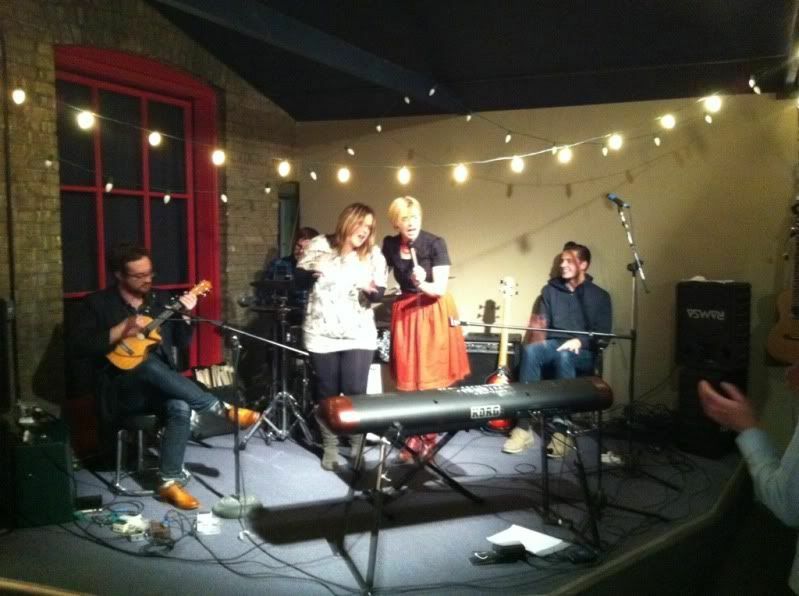 Chup took me to your favorite person Mindy Gledhill's private Christmas concert. I was like a freed rat from a cage. Man alive was I hyper. So hyper I had to warn everyone in the room. I had spent over two weeks mainly within the walls of my own home. I didn't even crack a window, that's how contained I've been. I took a dirty diaper out to the garbage can one day during this self-inflicted house arrested and I sniffed the air. I actually sniffed the air, like, "SO THIS IS WHAT FREEDOM SMELLS LIKE." But last night I put on my cranberry stain lipstick and boots and boy, did I get out. 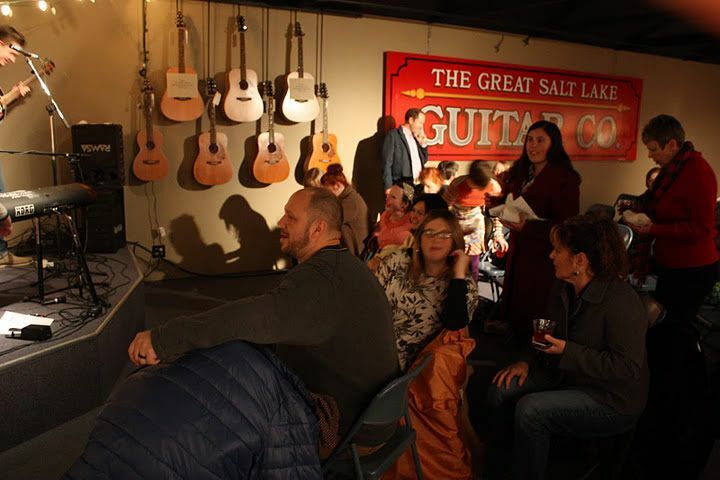 The concert was in the Great Salt Lake Guitar company--a cool guitar-building company in a beautiful old edifice in downtown Provo. Page took the time to inform our family, during the concert, that our great-great-grandfather once owned that building and it was likely a familial ghost was inhabiting the building. I love a good Christmas concert with a riveting ghost story. Have you heard of SCROOGE? I was thrilled when my friend Libbie Linton came out on stage to open for Mindy. Libbie has a voice like my dreams. And with her followed the perfectly coiffed Spencer Harrison. Chup said to me during this opening set, "I am going to like tonight." Then Mindy came out in all her holiday glory. She started the set with "Close to You" by the Carpenters. I said to Chup, "This is the most perfect Mindy Gledhill cover ever." Guess what? I was right. After that song was over Mindy talked about her connections with my family. She went to high school with Stephanie and half my in laws and cousins. My brother Topher directed her Winter Moon video (with puppets). She went to Kenya with Page. And me, she talked about how I sing with her on occasion and how her amazing guitarist Joe accompanied us last June on the Rooftops. Throughout the entire concert I really tried to keep a cap on the fireballish need of unleashing some pent up energy. Luckily my friend Tammy was sitting behind me and Tammy is sort of a connoisseur of my goofiness. Last October she paid for my dinner at P712 because I made her laugh. Well, that's what I told myself. At the end of the concert, Mindy says to the crowd "We have a tradition around here..."
"...whenever I perform with Courtney in the audience I like to invite her on stage to sing with me." So I did what I always do, I pretend that I HAD NO IDEA and then I run up on stage and rip the microphone out of her precious Mindy Gledhill hands. But this time, this time was different. This time was different because as I said before I just had a baby. JUST HAD A BABY. And you know, I really should be on maternity leave from performing. Yet, how could I turn down the invite on a night like last night, right? On the stage I jumped and in so doing I igniting a flame inside of me that could not be extinguished. Mindy announced we were going to sing the Christmas Song, which is that tune about Yuletide Carols Being Sung By A Choir and Folks Dressed Up Like Eskimos (sing it with me) Everybody Knows, Some Turkey and Some Mistletoe, Will Help To Make The Season Bright... (stop singing, continue reading). But Mindy and the band were singing this baby really up-tempo. I mean jazzy like. And I made the audience stand up and dance. So all this going on and suddenly I start laughing. Laughing and laughing and laughing. And then, (you know where this is going . . .) I started to pee my pants. So I did the whole cross the legs routine, and I crossed those legs like it was the only job I had in the world. I crossed and laughed and tried to sing. But no matter how hard I crossed, it seemed my postpartum body resisted. Thank you for the photo Nie Nie and guitarist Joe who continued on despite my obvious discomfort. In desperation I handed the microphone back over to Mindy and I picked up some conveniently place jingle bells and just tried to shake those babies. That's when I started praying. In my head, praying and shaking jingle bells and laughing. Oh baby, it was intense. We finished the song to much applause and clapping. I'd like to thank my family for that. They all knew what I had to battle just to get to the last bar. Weak bladders are the plague of our genetics. I am quite certain even that ancestorial ghost wondering the building cheered me on in understanding. Mindy put on a great show, and luckily I didn't ruin it after all. Plus, Steph brought cupcakes (goodies) for everyone and who doesn't like cupcakes? Me, mostly actually, but there were cakebites and WHO DOESN'T LIKE CAKEBITES? "You were so cute tonight." Shoot, if that man isn't careful I am going to be Postpartum Leaky Bladder Girl from now until menopause. Thanks Mindy and Steph for the party. Mindy's fun Christmas album is here. Libbie Linton's beautiful album is here. 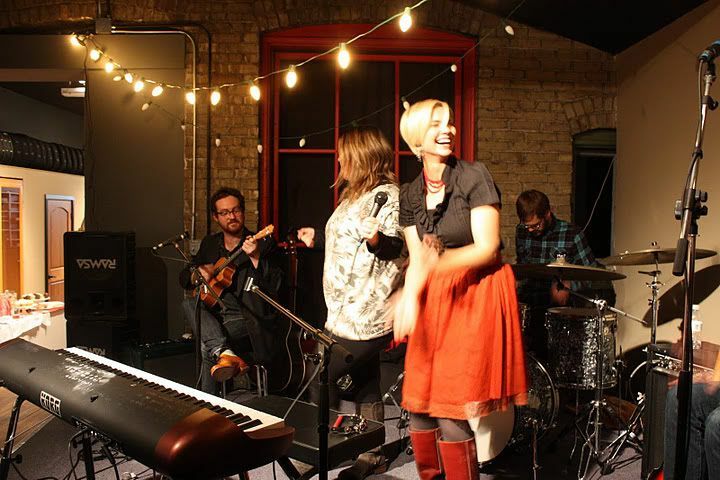 Mindy is performing at Velour tonight downtown Provo. Tickets still available. Go here.